With 1 euro we can buy a skipping rope for one of theatre workshops. 5 Euros will buy the materials for 1 talent development workshop (beads, paint, rope, stones, glue, tools), or one workshop in mask making (plaster, glue, paint, paper maché, feathers etc.). For 8 euros we can buy a punching bag on which the children can express their anger in our aggression management workshops. 10 Euros is enough to organize an entire workshop for 10 children! With 20 euros we can buy enough materials so that 10 children can make masks in the confidence building workshops. 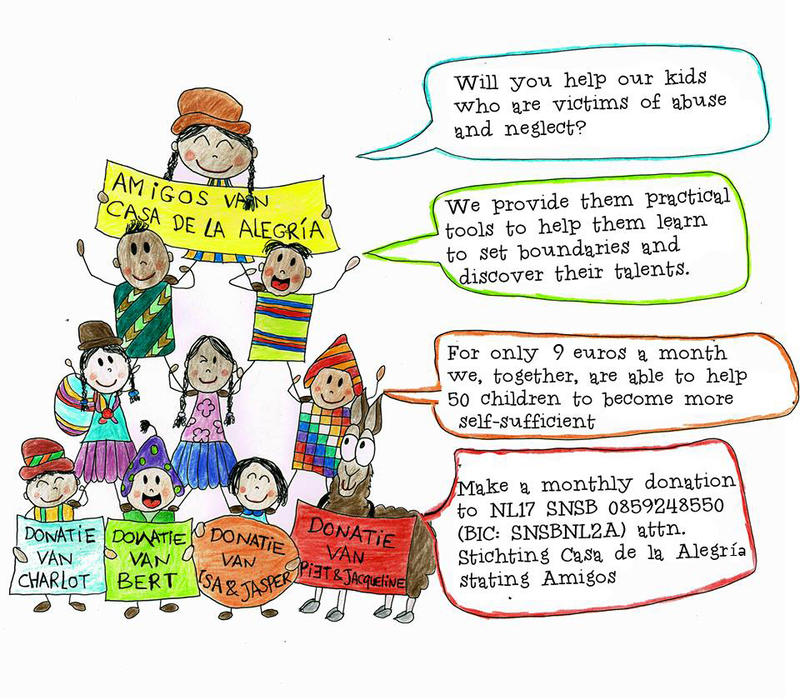 50 Euros will enable us to develop a new workshop or method, and thus make it possible to help the children even better. We are looking for 50 people that are willing to donate 9 euros every month. With this money we can help 5 groups of 20 kids for an entire year, and support them in building a better future for themselves in a sustainable way. Interested? Please contact info@casadelaalegria.nl. We are very grateful for every donation we receive, whether small, large, one-off or monthly! All donations are tax-deductible by way of our ANBI status. Our bank account number is NL17 SNSB 0859248550 in the name of Stichting Casa de la Alegría or use paypal.me/casadelaalegria.